After successful installation you will see following icon on your Chrome browser. It will open a drag and resizable area, select the web page portion you want to select and once ready click on “Capture” button at bottom of selection area. You can use “Save to Disk” option to save this image to your local drive. 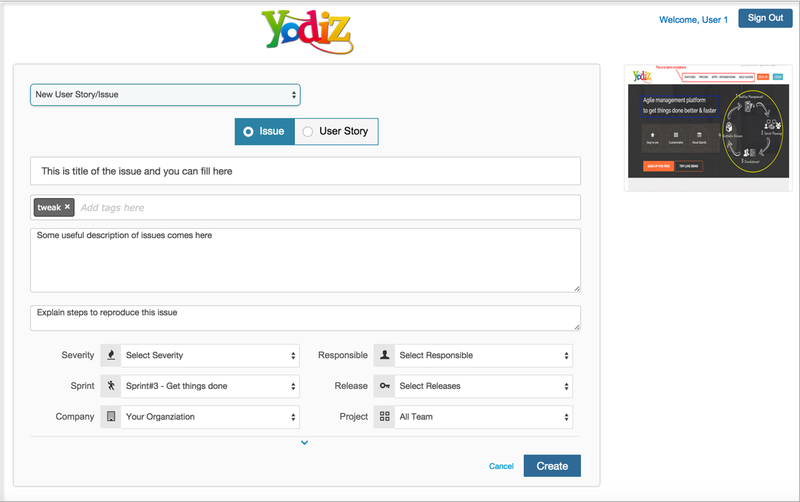 Click on “Report to Yodiz” button to send this screen shot as attachment to a new Bug or User Story. You will be thrown the Yodiz login page, enter your credentials and “Sign In”. To attach captured screenshot to existing issue or user story, select this option. You can then choose the items either by ID or Title. Search results are shown in multiple rows. Click on the row and it will highlight the “Attach” option. When you press “Attach” button, the annotated screenshot will be added as attachment to selected item.